While we were in Italy (photos later this week, if you want to see! ), I was looking for something souvenir-like to take home with me. I’m a big proponent of souvenirs being beautiful, useful and/or locally handcrafted. Better if they’re all of the above! After some thought–clothing? purse? a platter? linens? I settled on hunting down a pasta maker. I found Bartolini’s in Florence, and didn’t look back. It was fun to wander their store, and the staff were so helpful. After thinking about it over lunch, we bought an Atlas 150 Pasta Maker. 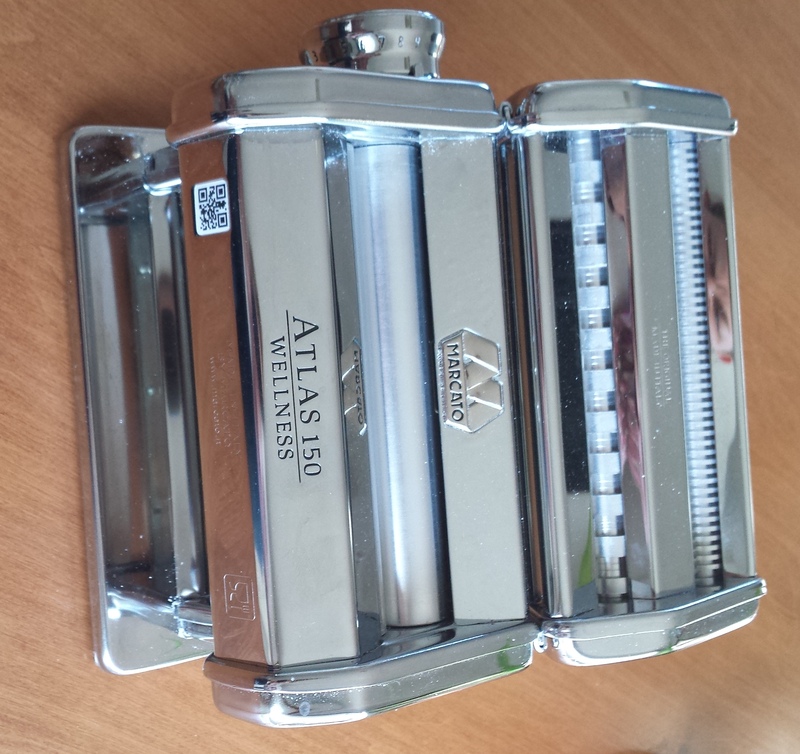 The Atlas is made in Italy, entirely stainless steel, and positively wonderful. If you follow me on Instagram, you know we gave the pasta maker its first go, and did beautifully! 1. Measure the flour into a bowl. Make a well in the middle, and crack the eggs in. Using a fork, mix the flour and the eggs. Add more flour if it’s too wet, and add water, teaspoon by teaspoon, if it feels too dry. 2. Knead with your fingers for 3-4 minutes, adding flour and water as needed. Your goal is a dough that is not too sticky–if it sticks to your fingers even a little, it needs more flour. 3. 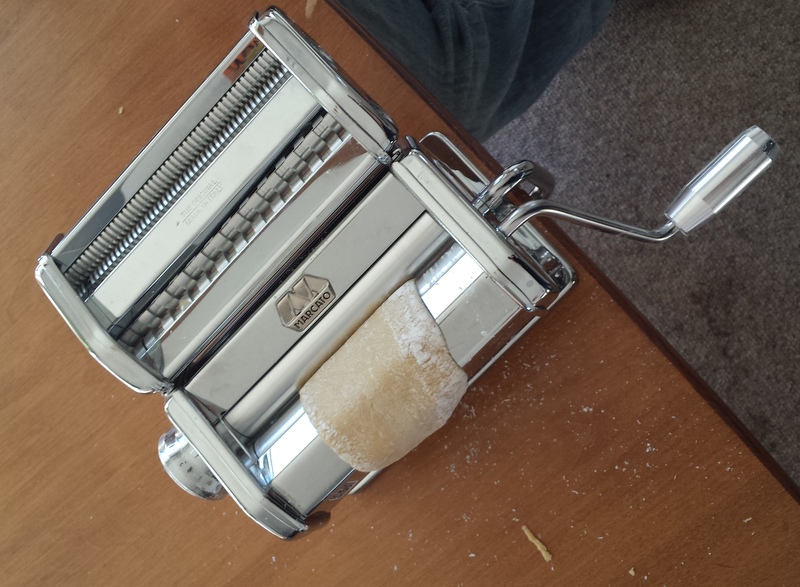 Chop off small chunks of dough and run through the pasta roller. 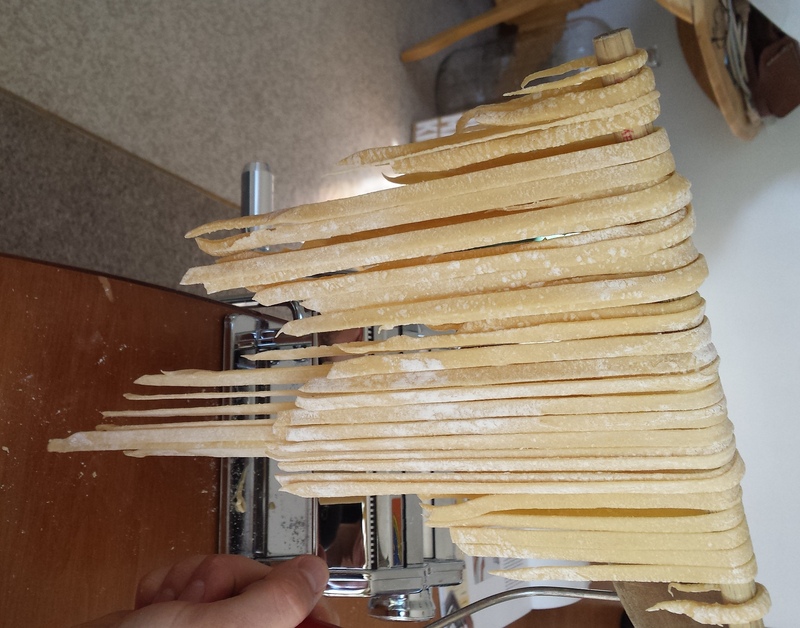 For fettuccine, you want to roll it out to a 5, for thinner pasta, roll it to a 7 (on the Atlas, anyway). 5. Bring water to a boil. The pasta will only need to cook 3 or 4 minutes, since it’s fresh. 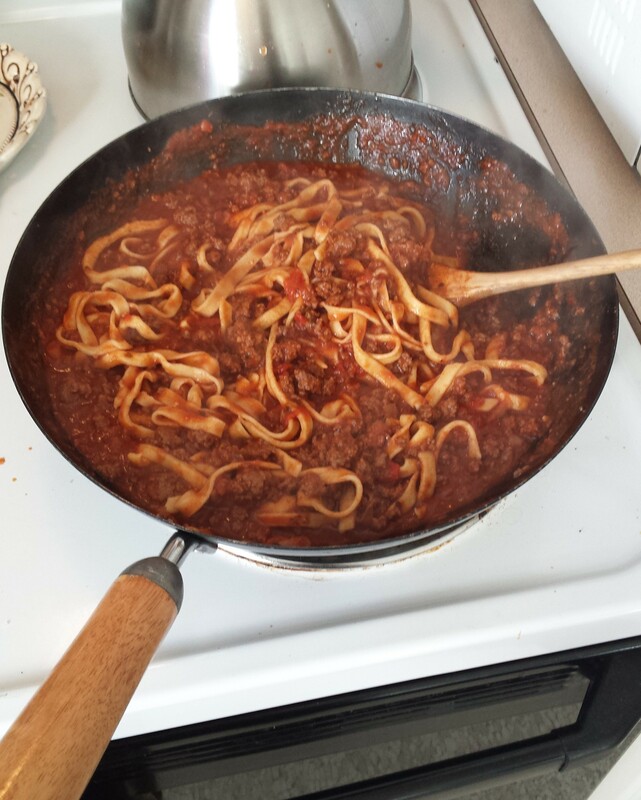 Drain, and serve with whatever sauce you like (we browned 1 lb hamburger, drained it, added one jar of marinara sauce, and a few tablespoons of the pasta water). And the verdict is: AMAZING. I was skeptical our first time around would be a flop, but it wasn’t. And the next time we make pasta, I’ll have my very own drying rack! 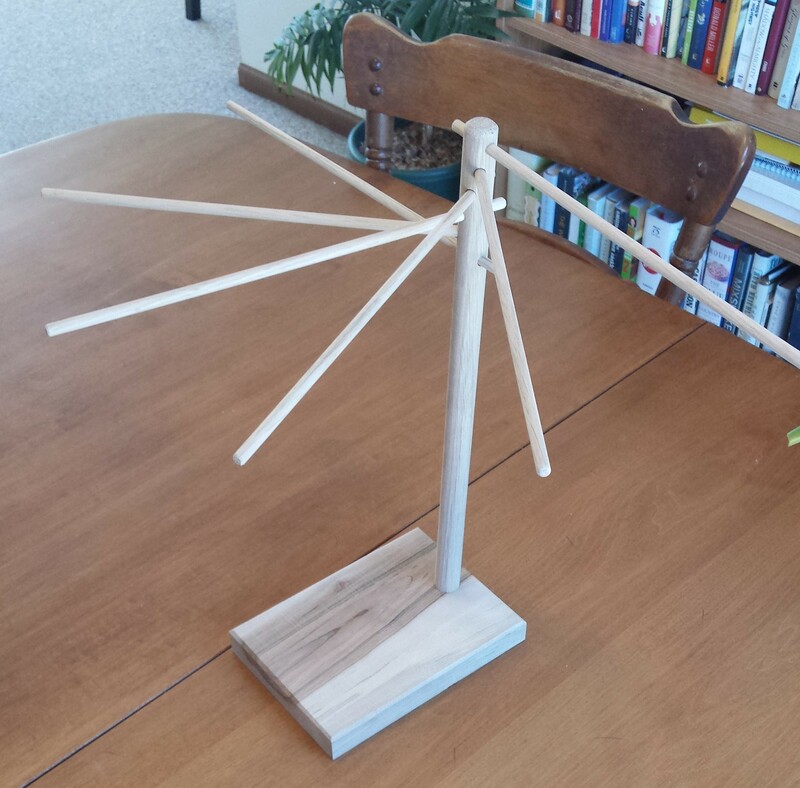 Bob made one with just a few supplies–he’s the best! 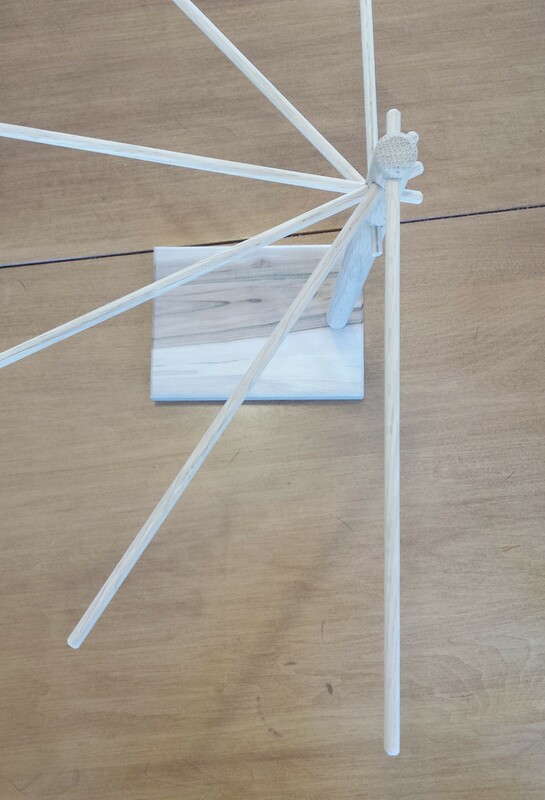 Cut the 1/4″ dowel into 12″ segments (you’ll have 6 total), and the 3/4″ dowel down to 16″. Using a drill press, drill a hole large enough for the 1/4″ dowel to fit perpendicularly in the top of the 3/4″ dowel. Rotate 30 degrees, and drill another hole 1/2″ lower than the first. Keep going, until you have 6 holes. Using a drill press, drill a hole in the base to hold the 3/4″ dowel. To finish it off, he beveled and sanded all of the edges. Before we use it, we’ll rub it with mineral oil. This is what resulted! Is he great, or what?